Nerja is one of the most sought-after destinations on the Costa del Sol. Its appeal is easy to understand, being one of the few booming holiday resorts that has kept its traditional fishing-village feel. 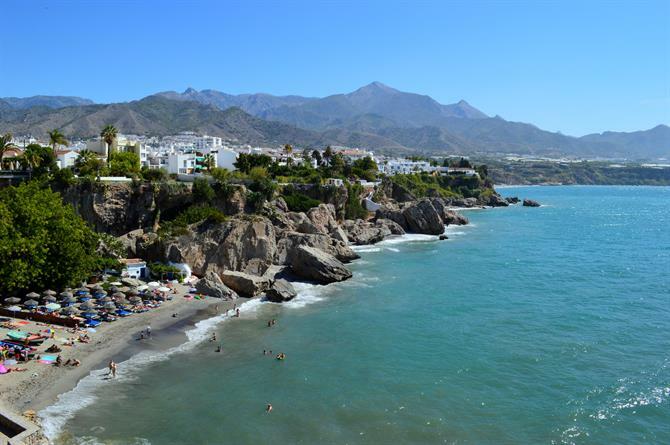 High on most people’s wish list when holidaying in Nerja is to visit one of the many beaches. The coastal landscape is a panorama of contrasts, from the long stretches of sandy beach that make up El Playazo to the more urban beaches of Torrecilla and Calahonda and onwards to the majestic Burriana and Maro beaches. This is a guide to the best Nerja’s beaches in Nerja, with pictures, videos, maps, restaurant tips and all the information you need to have an enjoyable day on any one of them. 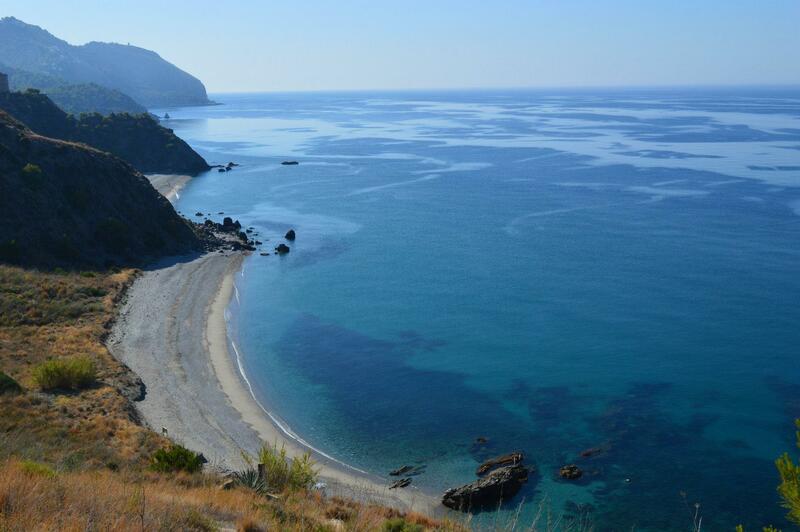 There are 12 beaches that sit within Nerja's provincial borders, 3 more feature on the list; Playa Alberquillas, Las Calas del Pino and Playa El Cañuelo. All of them are close to Nerja and are definitely worth a visit. 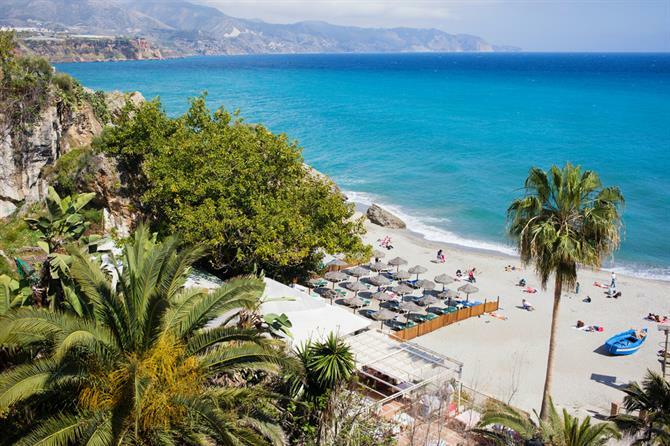 Burriana beach is without a doubt Nerja's most well known best-loved beach. A popular spot ever since the TV series 'Verano Azul,' put it firmly on the map. A large, sandy beach sitting just east of the town, this beach has been awarded a quality flag by the Spanish authorities. With watersports, restaurants and bars this beach is great for families staying in Nerja. Consistently voted as being one of the best beaches in Spain, Maro beach is a paradise. 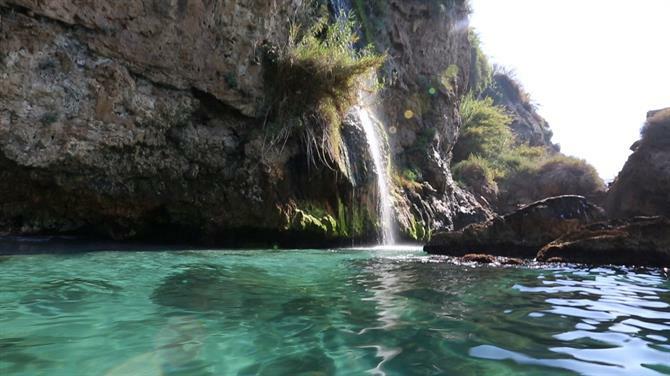 A land of hidden waterfalls, underwater caves and some of the best snorkelling around, all within a few kilometres from Nerja. Located in the small village of Maro, the beach is surrounded by a unique ecosystem and a protected natural environment. Maro beach's younger sister. The Caleta de Maro is the lesser known and quieter cove that sits adjacent to the Playa de Maro. 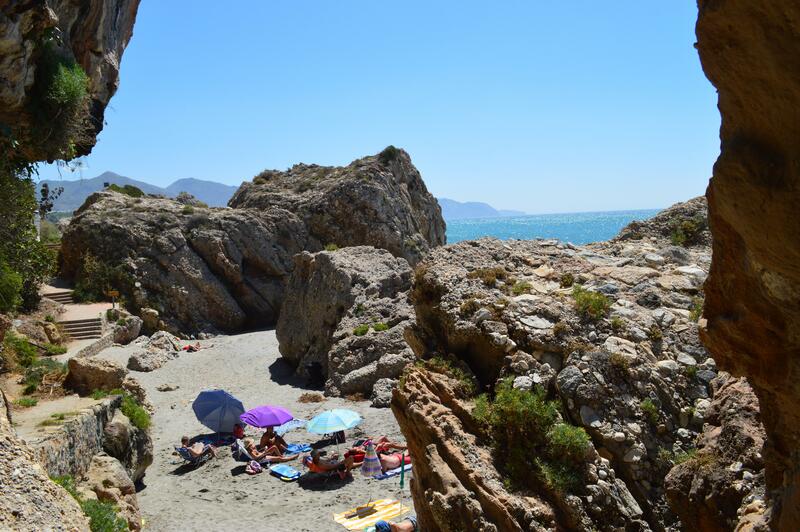 Clothing is optional on this remote beach in Nerja which is never too crowded. A visit La Caleta de Maro is highly recommended and is a popular spot with surfers from all over the Costa del Sol. 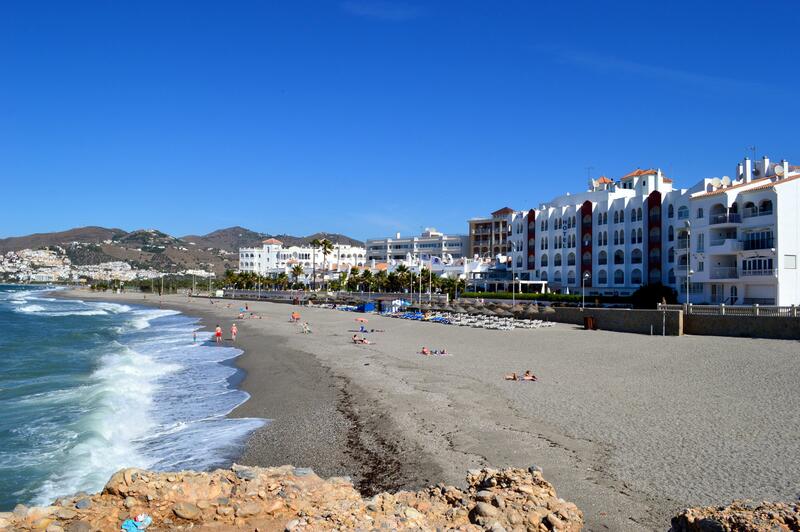 Situated just ten kilometres from the centre of Nerja, Alberquillas beach feels a world away. Clothing is optional, the beach is exceptionally clean and situated within the beautiful and protected Acantilados de Maro natural reserve. Because of its location, there are no facilities here, so its best to pack a picnic to bring for the day and umbrella and enjoy a beach day in Nerja away from the crowds with nature in its purest form. Las Calas del Pino beach, the pine coves, is a clothing optional beach that is situated right in the heart of the Acantilados de Maro natural reserve. Crystal clear waters, it is great for snorkelling and popular with divers, however, access can be difficult and there are no facilities so pack a lunch. They don't come much more beautiful than El Cañuelo beach. 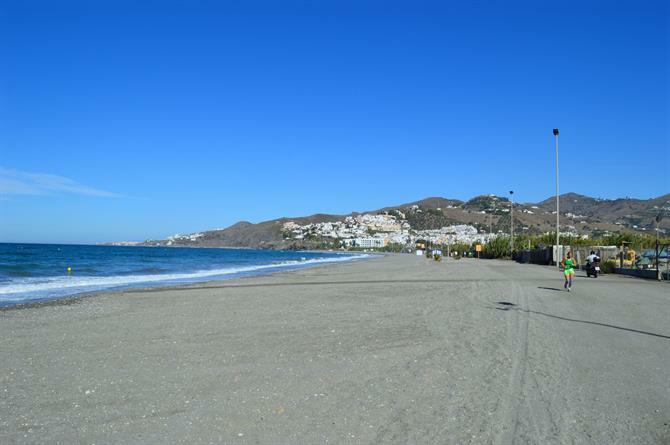 Situated right on the Malaga-Granada border, El Cañuelo is a fantastic beach for families. Great snorkelling, sheltered waters and some of the best scenery the coast has to offer. 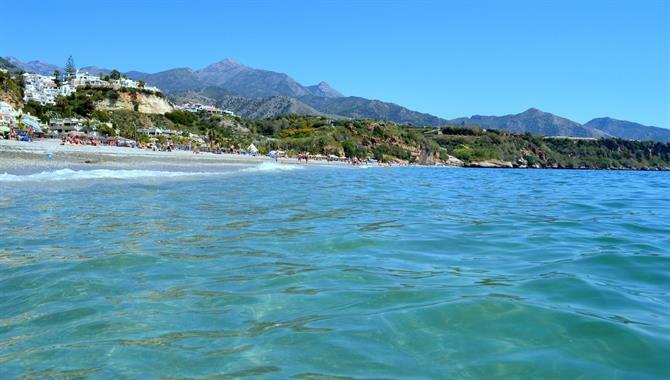 Secluded and surrounded by natural beauty it is considered as one of the best beaches on the Costa del Sol. Playazo beach is Nerja's largest and western-most beach. Looking to get away from it all and within easy walking distance from Nerja's city centre, then Playa Playazo is the place to be. In terms of facilities, there is plenty of parking as well as restaurants and cafes. El Chucho beach is situated between Playazo and Torrecilla beaches. The last beach on the western side to have a paseomaritimo - a seafront promenade. El Chucho is great for family days in Nerja as it has all the amenities available and the water is good for young swimmers. Torrecilla beach is one of Nerja's most popular beaches. Bars, restaurants and every service you could hope for at your fingertips. Within easy walking distance from the centre of Nerja, Torrecilla is Nerja's second most popular beach which has also been awarded 'blue flag' status by the EU. A small beach that is mainly frequented by Spanish families. El Salon beach sits to the right of the Balcón de Europa in a quiet cul-de-sac. The access road is easy to miss and ensures that the beach is never 'overly' crowded. You may be lucky and find a quiet cove of the beach to yourself. Sitting directly beneath the Balcón de Europa, La Caletilla is often mistaken for a private beach. It is, in fact, a very public beach. The smallest beach on the list. Caletilla is only 50m and has been known to disappear completely during high tides. One of Nerja's most iconic beaches. 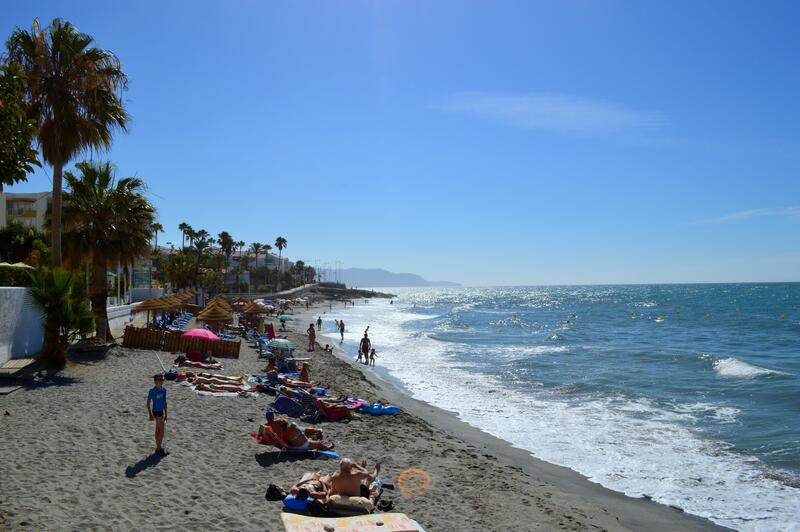 Playa de Calahonda seems to grace every postcard or Nerja-themed calendar. The restaurants and cafes above look out over this beach, it can get very crowded in high-season as it next to Nerja's most famous feature - Balcón de Europa. 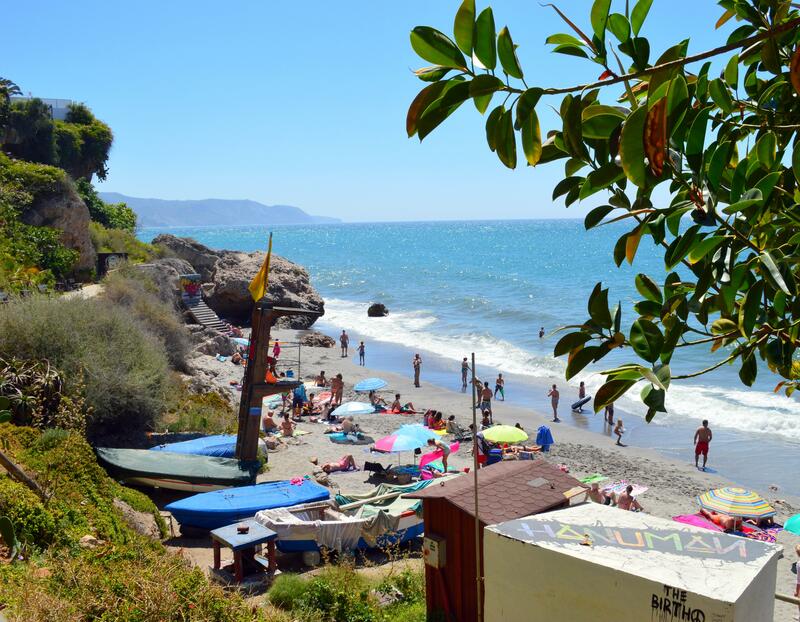 El Chorrillo beach is the name given to three coves that sit next to Playa de Calahonda. On a calm day, these hidden coves make a fantastic spot to spend the day. Sitting cosily beneath Sierra de Almijara, you kind find little spots sheltered from the sun and is perfect for a little privacy. Playa de Carabeo is a beach that is overlooked by many, despite being situated in the centre of Nerja. Access is via a steep flight of stairs that deters most visitors and is surrounded by huge rocks that protect its intimacy, meaning the beach is never overly-crowded. One of the most picturesque of all of Nerja's beaches. Carabeillo beach is a firm favourite with many. 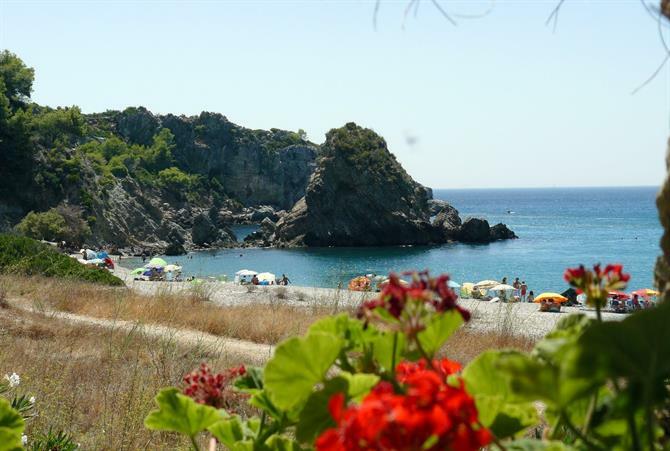 Surrounded by lush vegetation, clear waters and fine golden sand, Carabeillo beach is quite a sight and should be high on any visitors to Nerja's list. For facilities and refreshments, you can walk up to a kiosk, bars and restaurants as well as take a short walk to Burriana beach. With over 300 restaurants in Nerja, the choice is most definitely yours. Here are 10 of the best. One of the best family walks to be had in the area. The Chillar river in Nerja is a summer classic. 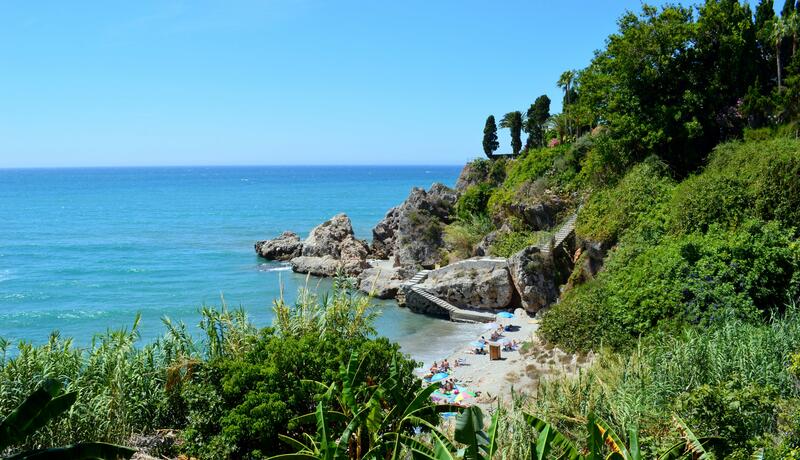 A guide to Nerja’s top 15 beaches. Pictures, videos, maps, restaurant tips and all the information you for the perfect beach day in Nerja. One of the most beautiful walks in the Sierras de Tejada is right on Nerja's doorstep, the majestic El Cielo mountain.